Fiserv’s $22 bln all-stock acquisition of the transaction processor at a 30 pct premium comes with plenty of cost savings. Revenue synergies would be icing on the cake. But as with KKR’s toppy leveraged buyout of First Data in 2007, market turns can undermine M&A logic. Traders work at the post that will trade First Data stocks during the company's initial public offering on the floor of the New York Stock Exchange October 15, 2015. Fiserv said on Jan. 16 it had agreed to buy First Data in a $22 billion all-stock deal. First Data investors will receive 0.303 Fiserv share for each First Data share they own. That represents $22.74 per share based on Fiserv’s closing price on Jan. 15, a 30 percent premium to First Data’s closing price the same day. Following the transaction, Fiserv investors will own 57.5 percent of the combined company, and First Data’s shareholders the remaining 42.5 percent. Fiserv Chief Executive Jeffery Yabuki will become CEO of the combined company, with Frank Bisignano, CEO of First Data, becoming chief operating officer. Private equity firm KKR, which via an affiliate controls approximately 39 percent of First Data stock and 86 percent of the voting rights, supports the deal. Upon closing it will own about 16 percent of the outstanding stock of the combined firm. Shares in Fiserv, which also reported earnings, were down 7 percent at 10:30 a.m. EST. 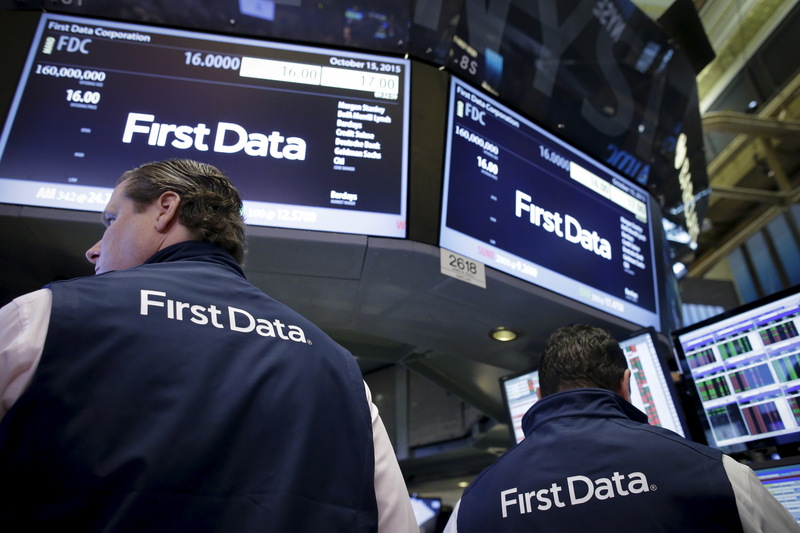 First Data shares were up 18 percent.